I had a fun Friday lunch|meeting with my friend Erin of Shawlsmith London at the end of last week, and it really got me thinking about the business landscape and what I'm interested in and feel most passionately about. It inspires me so much to be attempting to build a brand and business in the company of so many women. When I stopped to look around me, what I see is a thriving community of businesses started and run by a lot of really interesting, smart and funny ladies. I don't want to get all girl power on you, but I am incredibly encouraged by what has emerged out of this horrible recession. Fleur is celebrating 10 years in business this month. Charlotte's has been a mainstay since we were little bits. 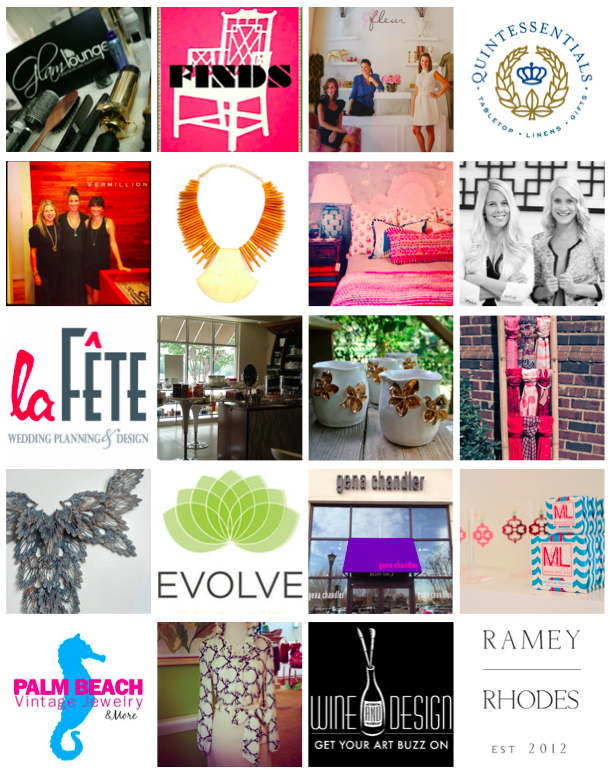 There are super talented jewelry designers, beauty gurus, artists and DIY geniuses setting up shop. The businesses above are literally just a few folks I thought of in short order, and are just representing Raleigh. It is happening across the South though, and further, and it's awesome. See below for the shops pictured, and please feel free to shout out your favorites that I've missed! Check these ladies out; shop them, like them, get to know them! They are all amazing at what they do. If you're thinking about going for it, close your eyes and jump, there are plenty of people here to help and to cheer you on!